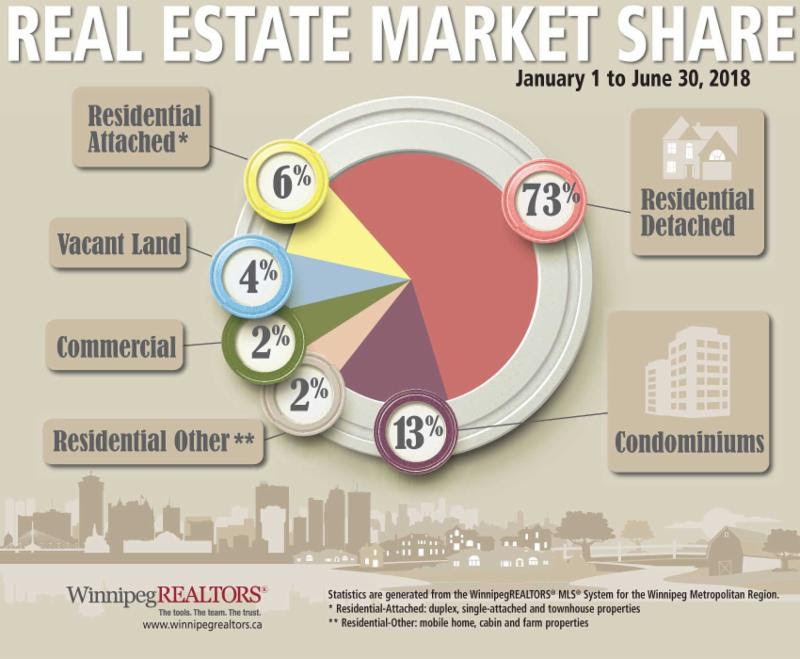 WINNIPEG – June sales activity outperformed May this year and usually it is the other way around. This helps explain adjustments that are going on within the local market to account for more stringent mortgage qualifications based on higher interest rates and the federal stress test. June sales of 1,547 decreased 5% over June 2017 and 1% over the 5-year average for this month. Listing activity for June increased 1% over the same month last year while the current inventory of 5,206 at month end was up 6%. June dollar volume of $473 million is down 3% over June 2017 and ahead of all other previous months of June including the best June on record in 2016 of 1,638 sales. Year-to-date sales activity for the first six months is down 7% in comparison to the same period in 2017 and 2016 but off only 2% from the 5-year average. Year-to- date dollar volume of close to $2 billion dipped 2% from the same period last year and 1% from the record- setting year of 2016. 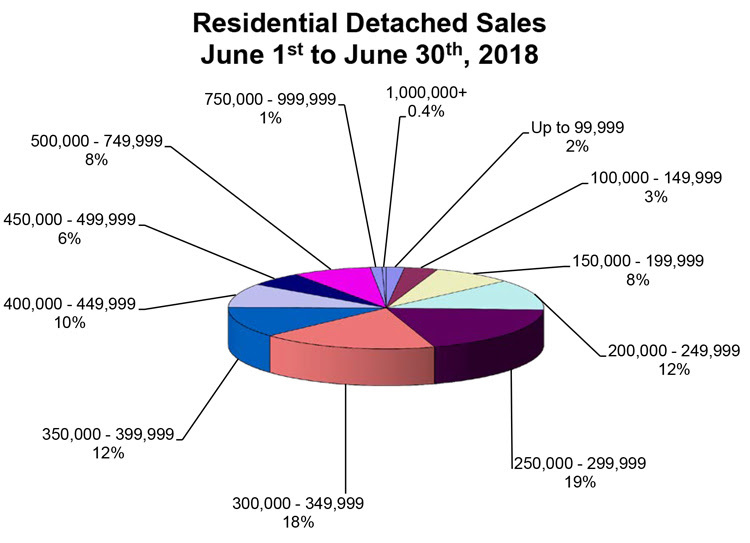 In June alone, residential-detached sales under $300,000 decreased 19% over June 2017 while sales over $300,000 showed a 4% gain. The same can be said for condominiums where very active sales areas like Osborne Village are seeing a noticeable drop in sales for the first six months this year compared to the same period in 2017. Another indicator of less sales activity in the first half of this year is when you observe the percentage of listings entered on the market that have been sold. Residential-detached listings had a drop in percentage of listings sold from 61% to 56% while condominiums has gone from 44% of listings sold in 2017 to 40% this year. As for the properties which are selling this year, average days to sell is slightly better with the average days to sell a residential-detached property at 27 days instead of 28 in 2017. Similarly, the average days to sell a condo is one day quicker in 2018 at 42 days. There are some clear differences however between residential-detached and condominiums at the half-way point this year. They include listings selling for above list price, the average year-to-date sales price and supply of listings available for sale. The supply of condo listings relative to monthly demand is over five and one-half months whereas residential-detached is less than two and one-half months. The number of residential-detached listings selling for above list price for the first six months is 25% while for condominiums it is 9%. The average year-to-date residential –detached sales price is $325,314, a 2% increase over the same period in 2017. For condominiums, its year-to-date average sales price is $240,873, a decrease of less than 1% in comparison to 2017. Speaking of average sale prices, the chart below shows how the various MLS® zones within Winnipeg and the rural one outside the city are doing this year in comparison to 2017. Other than the southeast MLS® zone of Winnipeg, where the average residential-detached sales price dropped from $366,288 in 2017 to $359,876 this year, all other zones showed increases with the northeast zone up the most from $248,968 to $287,841.